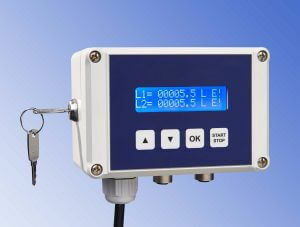 Flowview 2S – II is a display unit for the flow rates of a maximum of two Flowmax drink meters and their voltage supply. The Flowview 2S-II is supplied with power via an already connected Schuko plug and a customer-side 230 V/AC socket. The Flowview 2S-II contains the power supply for 1 or 2 Flowmax 30S via circular connector. The counting stops of the dispensing volumes are displayed via a two-line display. A key switch allows you to switch from the operating mode to the cleaning mode. The two counters can be reset to zero each other via the keyboard. Display in liters with 5 digits in front of the point and 1 after.